Advanced optical technology allows use on more surfaces than either an optical or laser mouse. 2.4GHz wireless provides range up to 15'. Compact nano transceiver can stay connected to your notebook computer when you travel. Battery typically provides up to 8 months of use. Power status indicator lets you know when a replacement is needed. You'll appreciate how this wireless mobile mouse comfortably fits your hand and your mobile lifestyle. Use it just about anywhere, even on a rough park bench or your living room carpet, relying on Microsoft BlueTrack Technology1BlueTrack Technology does not work on clear glass or mirrored surfaces. When it’s time to pack up and go, you’ll hardly notice the tiny transceiver. 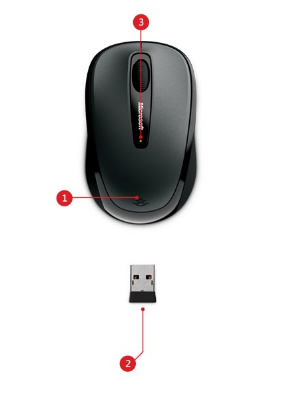 Keep it plugged into the USB port, or stow it in the bottom of the mouse for travel. Keep using your mouse for up to eight months with a single battery, and rely on the power indicator to tell you when it’s time to replace it.